When I was little, my mom and I would spend our weekends at our family house in Michigan. There was a store down the road the sold the BEST banana bread ever. Seriously- I’d eat the entire loaf by the end of the day. This is my favorite recipe for banana bread. 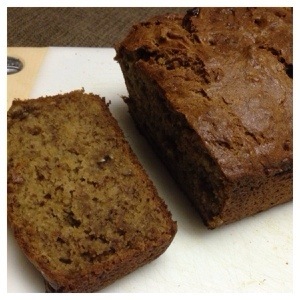 The best part is, banana bread is meant to be heavy so gluten free baking is a little easier. I suggest using your favorite gluten free flour and for stuff like this my “go-to” choice is Namaste Foods Perfect Flour Blend. Xanthan gum is already included so it’s one less step to worry about! Allow bread to cool for 5-10 minutes before removing from the pan. It should cool completely before slicing. If you’re looking for an extra treat, you can sprinkle powdered sugar on slices as well!